The editors, authors, and staff of The Encyclopedia of Greater Philadelphia are honored to welcome scholars from Vietnam on November 29. Under the auspices of the Social Science Research Council, the delegation has come to the United States to learn about encyclopedia projects in preparation for producing an Encyclopedia of Vietnam. Read more about the visit on the website of Rutgers-Camden, where The Encyclopedia of Greater Philadelphia is produced. The Encyclopedia of Greater Philadelphia has been growing rapidly this summer, and we are pleased to announce that the project has reached a new milestone: 550 topics published online. The 550th essay to be published is Dispensaries, by Steven J. Peitzman, a longtime contributor who participated in one of our early Greater Philadelphia Roundtable programs, "City of Firsts." He has written two previous essays for The Encyclopedia: City of Medicine and Typhoid Fever and Filtered Water. This week The Encyclopedia of Greater Philadelphia reached 500 essays online -- a major milestone for the project. The editors extend thanks to all of the authors, editors, project partners, and staff members who have contributed their time and talents to creating this unparalleled resource for understanding the Philadelphia region's history and experience. Topic #500 is Italians and Italy, by Stefano Luconi. Click here to read the essay and explore links to related reading, collections, places to visit, and websites. To join more than 325 leading and emerging scholars who have already contributed to this peer-reviewed, digital-first project, let us know your choice of topics and choice of deadline from the end of August through December 2017. Prospective authors must have expertise in their chosen subjects demonstrated by previous publications and/or advanced training in historical research. The scope of the project includes the city of Philadelphia and the surrounding region of southeastern Pennsylvania, South Jersey, and northern Delaware. To express interest, please send an email describing your qualifications and specifying topics of interest to the editor-in-chief, Charlene Mires, cmires@camden.rutgers.edu. No attachments, please. Graduate students, please include the name and email address of an academic reference. The first event of the spring semester for Penn Urban Studies will feature a talk by Timothy P.R. Weaver, the author of the essay about Enterprise Zones and Empowerment Zones in The Encyclopedia of Greater Philadelphia. Weaver, who is Assistant Professor of Political Science at the University at Albany, will speak about his book, Blazing the Neoliberal Trail: Urban Political Development in the United States and the United Kingdom (University of Pennsylvania Press, 2015). His talk, titled "The Rise of the Market City: Unfettered Capitalism and Urban Transformation in the U.S. and the U.K.," will begin at 5:30 p.m. on Thursday, January 19, at the Penn Bookstore, Thirty-Sixth and Walnut Streets, Philadelphia. With the help of so many writers, editors, project partners, and financial supporters, The Encyclopedia of Greater Philadelphia has reached a new publishing milestone of 450 topics online--an increase of more than 150 topics from this time a year ago. The distinction of being topic No. 450 goes to the new essay about Norristown, Pennsylvania, by Michael D. Shaffer. The current phase of expansion is supported by the National Endowment for the Humanities, the Mayor's Fund for Philadelphia, and Poor Richard's Charitable Trust. To watch us climb to more than 500 topics this spring, follow us on Facebook or Twitter or sign up for our list-serv by submitting your email address on the home page. Thank you for your support! 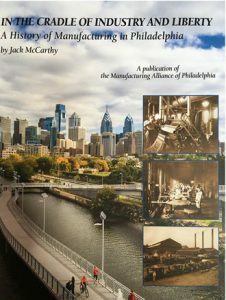 Philadelphia's manufacturing history is the subject of a new book by archivist and historian Jack McCarthy, best known to readers of The Encyclopedia of Greater Philadelphia as the author of many of our music topics. In the Cradle of Industry & Liberty: A History of Manufacturing in Philadelphia, published for the Manufacturing Alliance of Philadelphia by HPN Books, traces local manufacturing from the colonial period to the transition to machine-based factory production methods, the development of manufacturing on a massive scale, and the dramatic downsizing in manufacturing that led to the city’s transition to a post-industrial, service-based economy. This month, McCarthy will talk about the topics of his book at a meeting of the Philadelphia Association of Tour Guides on January 11 and at the annual dinner of the Philadelphia Chapter of the Society for Industrial Archaeology on January 20. The most-visited topics for 2016 reflect the issues of the presidential year, topics of interest for students and teachers, and some perennial Philadelphia favorites. Watch for more new topics in the new year as we continue to expand The Encyclopedia of Greater Philadelphia. Thank you for your support! In 1776, Delaware declared independence from both England and Pennsylvania. Originally known as the Three Lower Counties of Pennsylvania, the First State was instrumental in the fight to form a new republic. The Marquis de Lafayette, Nathanael Greene and George Washington all made trips to the state. Caesar Rodney’s ride and the Battle of Cooch’s Bridge are legendary, but the state has many unsung heroes. Citizens from every village, town, crossroads and marsh risked their lives to support their beliefs. Author Kim Burdick offers the carefully documented story of ordinary people coping with extraordinary circumstances. 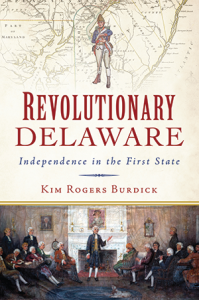 Kim Burdick will speak and sign copies of her book on Saturday, December 17, at 10:30 a.m. at the Kirkwood Library, 6000 Kirkwood Highway, Wilmington, Delaware.